Starring: Amitabh Bachchan, Manoj Bajpai, Yami Gautam, Amit Sadh, Jackie Shroff, Rohini Hattangadi, Ronit Roy, Bharat Dabholkar, Parag Tyagi, Bajrangbali Singh. 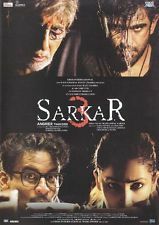 Sarkar 3 is RGV's desperate attempt to regain lost territory and he does succeed to a certain level. The movie is for those who have the patience to wait till the climax when all the pieces finally come together to complete this puzzle called Sarkar 3. As always in a Ram Gopal Varma movie, the camera work and the background score are exceptionally good. The movie has nothing new to offer but some fine performances by Mr. Bachchan and Amit Sadh make up for the slow pace. Manoj Bajpai is impressive as Govind while Bajrangbali Singh who plays Gandhi is a great find. Yami Gautam holds on to the same 'horrifying' expression throughout the movie. Ronit Roy is another fine actor who never lets his audience down although Jackie Shroff does get on your nerves. Unlike Sarkar, the movie has no great dialogues worth remembering. All said and done, the movie is a good reminder of the elite class of directors RGV once belonged to.